I take this bean thing seriously, so it was a personal challenge to incorporate epazote into my quest to make the best ever bowl of beans. I take this bean thing seriously, so when we got epazote in our CSA share and I learned it was often used as a bean seasoning, I took it as a personal challenge to incorporate the herb in my next iteration of legume goodness. This recipe makes 6 to 8 servings of beans or as I like to say “plenty for leftovers!” These beans will keep their flavor and texture for up to a week in the fridge, making this a great dish for folks who only have time to cook on the weekends. Of course keeping them around for a week implies that you won’t eat them before which is highly doubtful. 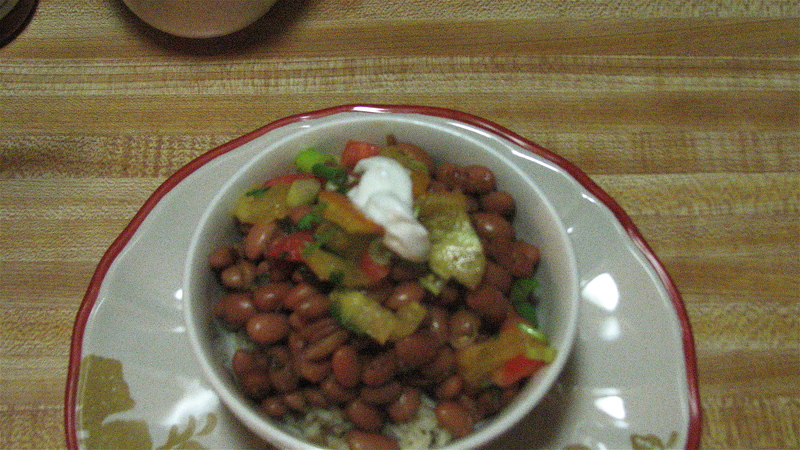 We almost always serve the beans over rice we season ourselves in the rice cooker, but they are scrumptious on their own. I garnished this batch with 2% Greek yogurt and homemade pico de gallo (which you can whip up and chill while the beans are cooking). * Cayenne is a strong spice. One ½ Teaspoon will give your beans enough kick that you will taste the spice. A full teaspoon will make the beans so spicy that those who don’t like spicy foods will not enjoy them. So keep in mind whom you are cooking for as you add the pepper. You can follow the instructions on the back of your bean package, but rinsing beans is as simple as it sounds. Simply run your beans under lukewarm water, and as the dirt is washed away, remove any small stones, plant matter, or weird looking beans. Soak your beans in 8 cups of water for approximately 8 hours. In a warm kitchen you may be able to drain them in 6 hours, but allowing the beans the full 8 hours helps ensure a tender bean when all is said and done. 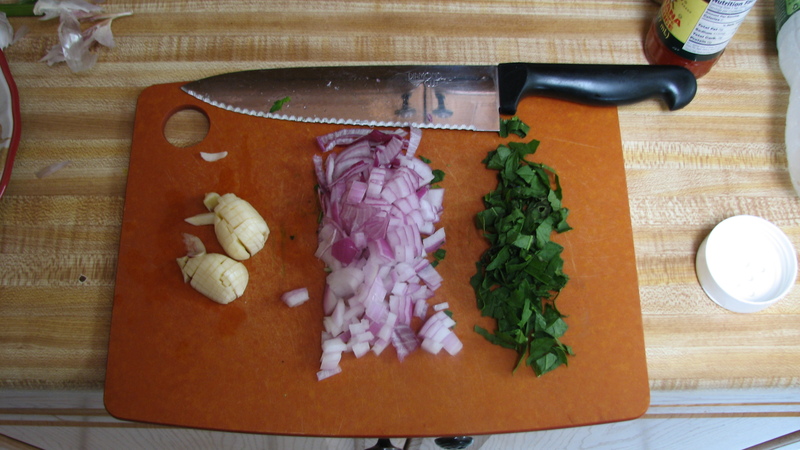 Chop onion, garlic, and epazote, but keep them separate. Drain your beans over a colander, but DO NOT rinse them again. Rinsing beans after they have soaked essentially washes away some of their natural flavor. While the beans are resting in the colander, heat the olive oil in a wide thick bottomed pot (DO NOT use a non-stick pot). Once the oil is hot (which you can test by sprinkling in a little water and waiting for the oil to sizzle), add the chopped onion. When the onions begin to soften (but before they are clear), add the garlic and cook until the onions become translucent (clear). Stir the sautéing vegetables from time to time so the garlic does not burn. 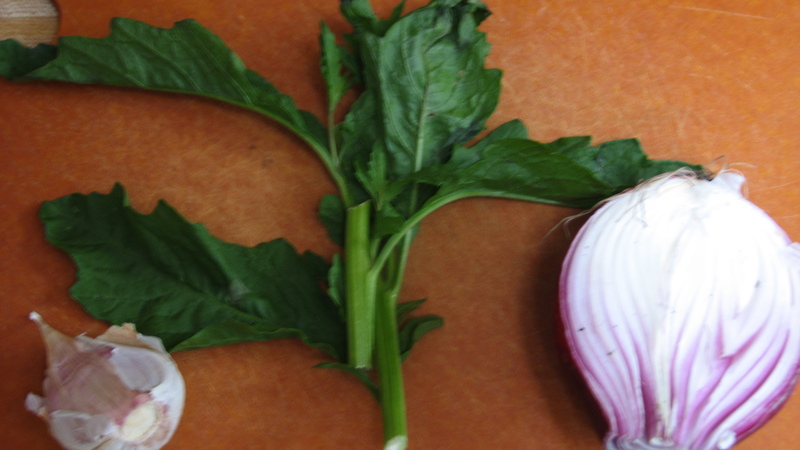 When the onion are translucent, add the chopped epazote and let the vegetables cook until the onions begin to carmelize (turn brown). Add eight cups of lukewarm water to vegetables. 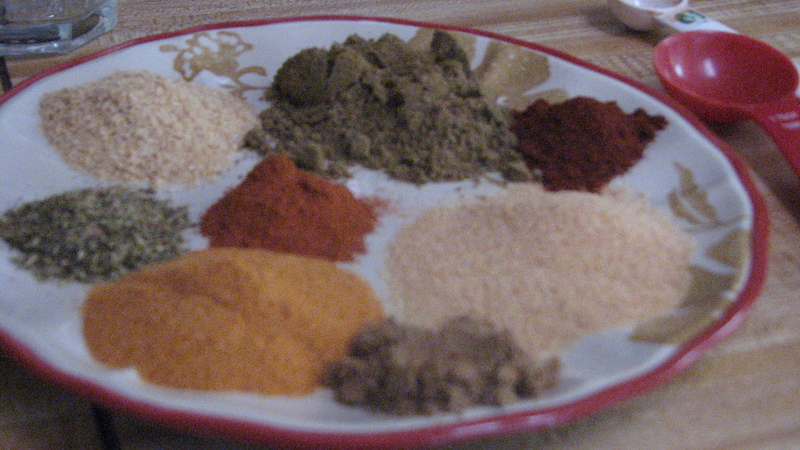 As the water heats, add the dried spices. Once the spices are added, cover the pot and bring it to a boil. 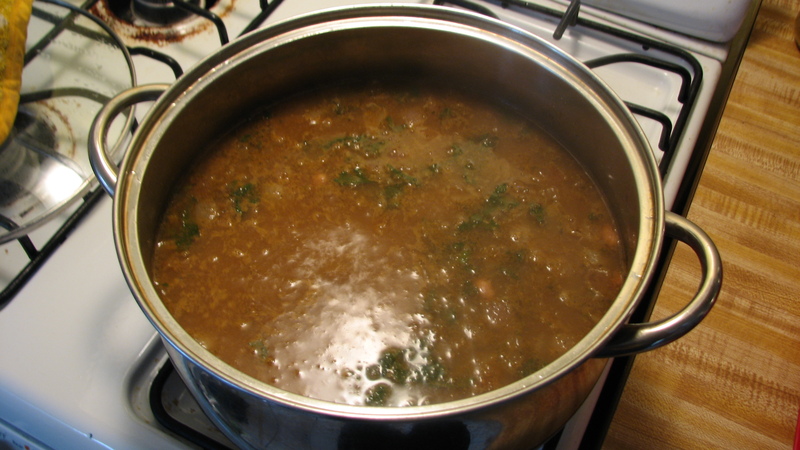 Once the broth is boiling, add the beans, being careful not to splash yourself with the boiling broth. Cover the pot and let the beans and broth once again reach a boil. 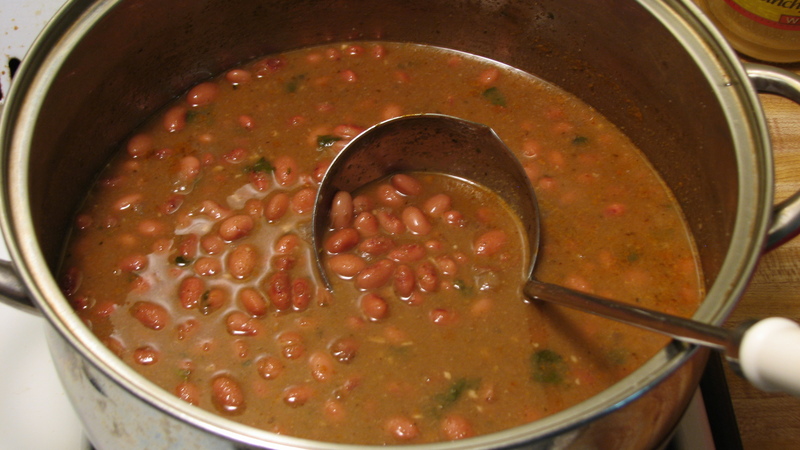 Once the beans reach a rapid boil, remove the lid and reduce the temperature to simmer. Once the beans have reduced to a simmer, stir the pot and replace the lid. Let the beans cook (covered) on a simmer for 60 to 75 minutes, stirring occasionally. 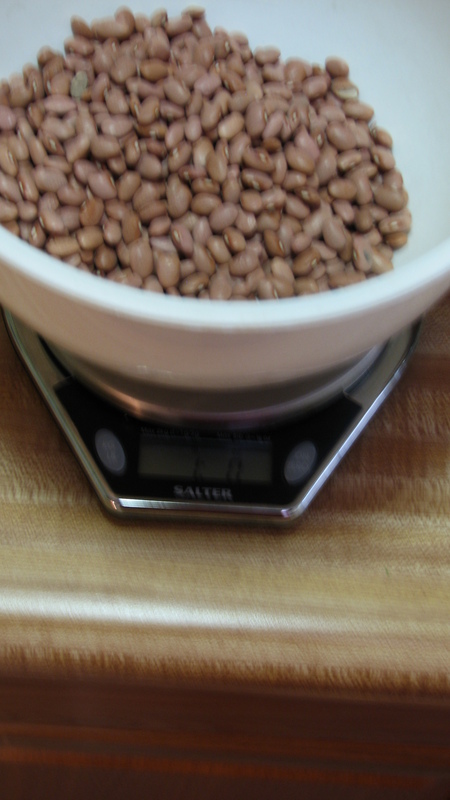 After the beans have simmered for 60 to 75 minutes, test their tenderness. A neat way to do this is by blowing on 2 or 3 beans in a spoon. The skin on a tender bean will peal back and the bean itself may split. If the beans pass the “blow test,” taste them. If the bean tastes dry on the inside, or if the skin still offers more resistance than you prefer, let them cook (covered), for 10 to 15 minutes more. When your beans have reached their desired tenderness, remove the lid and let them cook for 5 to 15 minutes more depending on how much broth you desire (the longer you cook the beans uncovered, the more the sauce will reduce). Plate the beans up and dig in. 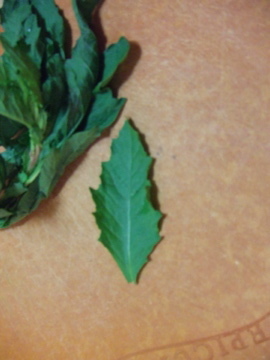 I grew epazote in my garden this year and had no idea how to use it. It has such a pungent smell when it’s fresh, so I was hesitant to cook with it, but I tried your recipe last night and it was delicious. Thanks for the help!